George WashingtonThere is no more important figure in our nation's history than George Washington. 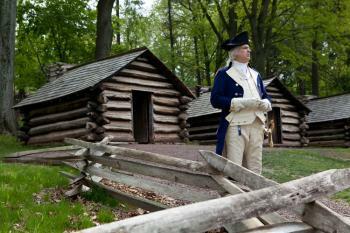 As a politician and a soldier, Washington is who all those that followed have aspired to be. Washington began his military career during the French and Indian War, where he served in the Virginia militia, eventually rising to the rank of colonel in the British Army where he commanded the Virginia Regiment. Following the war, Washington was lived an aristocratic life, earning a living on his tobacco crops. Being one of the social and political elite of Virginia, Washington was elected as a representative to both the First and Second Continental Congresses. At the Second Continental Congress, Washington was appointed Commander-In-Chief of the newly formed Continental Army. Washington took control of the Army in 1775, and made an immediate impact by driving the British force out of Boston. Unfortunately things took a turn for the worse for the Americans with a heavy loss in the 1776 Battle of Long Island. His midnight crossing of the Delaware River, and subsequent attack on the British Forces in Trenton helped the Americans secure New Jersey, driving the British back into New York. The year 1777 would become a pivotal one for Washington and the American Revolution. Washington was outmaneuvered by General William Howe, allowing the British to take control of Philadelphia, the Colonial capital, on September 26. After another defeat in Germantown in October, Washington encamped his army in Whitemarsh before moving to a more strategic location in Valley Forge. The Continental Army marched in to Valley Forge on December 19, 1777. For the next six months, Washington drilled his troops with the help of General von Steuben. Despite heavy casualties as a result of disease (estimates range between 2000 and 3000 men), the Army emerged from Valley Forge stronger than ever. After the British abandoned Philadelphia, Washington forced his nemesis into New York. In 1779. The war drug on until 1781, when after more than six years of fighting, the Continental Army, with the help of the French navy, trapped the British in Virginia, forcing surrender at Yorktown. With the war now over, Washington again retired to Mount Vernon, but was coaxed into attending the Constitutional Convention in Philadelphia in 1787 where he was unanimously elected president of the Convention. Two years later, again in a unanimous decision, Washington was elected the first president of the United States. He would serve two terms, leaving office in 1797. His military career was not yet over as John Adams once again appointed him Commander-in-chief of the armies from July 13, 1798 until his death on December 12, 1799.